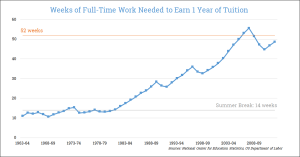 An article by Jarrett Moreno at Attn: ran the above chart which shows how many hours of minimum wage a student must work in order to afford the average blended tuition of private and state colleges. The debate internal to that website got interesting. The author originally intended the piece to pressure legislative action toward an improved minimum wage but after lots of interaction with the online comments he penned another piece in which he acknowledged the bigger, truer problem to be that of tuition hikes. 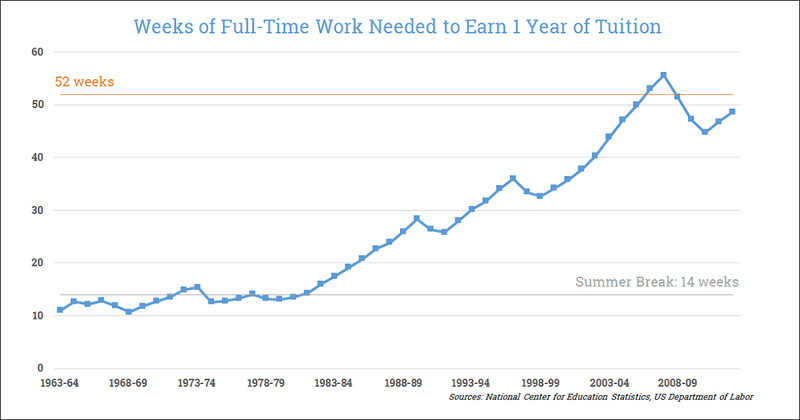 Whatever the reason, it is true that today a student must work a full time job at minimum wage nearly year-round to afford the average tuition whereas previous generations could knock out school bills with a summer job alone. What to do about this fact? Do we write our congresspersons and hope they get around to raising minimum wage or imposing tuition freezes on our schools? Or do we indeed work full-time, year-round while maintaining a full class schedule? To make it through college in one piece most students will likely need to bring in some money by working for it. But in terms of wages we face a classic catch-22 situation: Students often pay for college to qualify for a good job but without a good job they cannot pay for college. 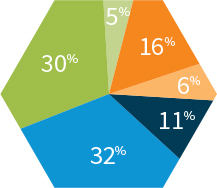 Chart: Can You Still Work Your Way Through College? 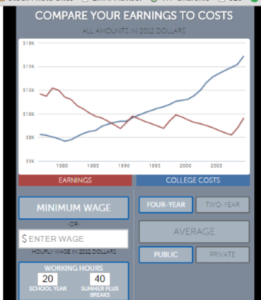 Now we get a little bit of interactivity with our chart, thanks to the work of the good folks at PBS. It goes a long way to answering the question “Can You Still Work Your Way Through College?” with the ability to input some of your own data. This chart comes from Josh Zumbrun of the Wall Street Journal, who has reported and charted some findings of a recent data set from Moody’s Analytics. 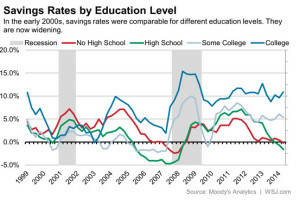 Recent research has shown that individual savings rates of late seem to be correlated to the amount of college education one has. Those with a college degree and some college under their belt save at a much higher rate than their high school diploma and drop-out counterparts. This is encouraging news that despite the bleak reports of high college-associated debt loads and a dismal post-graduation job market college graduates tend to do better not only in terms of lifetime earnings but also lifetime savings. This chart comes to us as part of a series of data included in Sallie Mae‘s most recent “How America Pays for College” report. 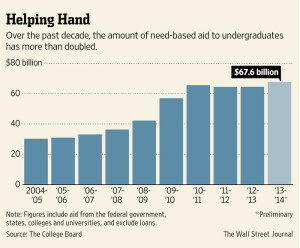 Of note this past year was the big increase in family assistance relative to other college funding sources. The average cost-to-student will run $24,164 in 2015, a substantial increase (about $3,300) from last year. To cover this increase, parental help has also ratcheted up, with an average of $10,365 coming from mom and dad to cover the bills (up about $1500 year over year). In fact, parental resources have now become “… the number one source of funding, surpassing scholarships and grants for the first time since 2010.” According to Sallie Mae parental assets now account for 32% of total funding versus 30% from scholarships and grants. Also interesting to note, student efforts account for a full 27% of the total, split between income, savings, and borrowing. In other words, with bills running almost $100,000 over a four-year period students and/or their families can expect to cover well over half of that total on average. Thing is, the “average” family I know doesn’t have that kind of money available. Thus I see over and over again students running off to college with everything they can muster financially thrown into the maw, only to return home a year or two later broke, confused, and frustrated at the experience. The nationwide data seems to support this trend. Families must be vigilant as they plan their help to avoid this fate. For this reason I highly recommend exploring other options for boosting assets and decreasing costs. Also, it becomes extremely prudent to map out not only what students and parents have to offer, but to budget when the proceeds shall be applied to the college experience in order that the student can explore their options knowing the price point they must hit on a per-year basis. Chart: Can You Claim It? 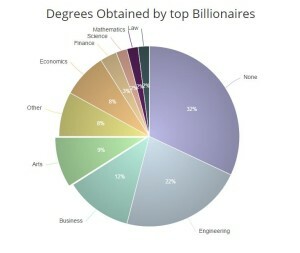 This chart comes to us via the Federal student loan lending agency, Sallie Mae, via Business Wire. The chart highlights three commonly available but oft misunderstood tax breaks for education expenses. While the typical expense for college far exceeds the credits and deductions available, a few thousand bucks back from Uncle Same can certainly ease the bite. Note, too, that credits are available for non-traditional students, i.e. the worker who wants to augment a resume with job training. We’ll explore this more in our next Tip of the Week, but in the meantime be sure to work your way through the chart and related news release prior to filing your taxes to make sure you’re aware enough to file accordingly. For more on these tax benefits, see this related post. 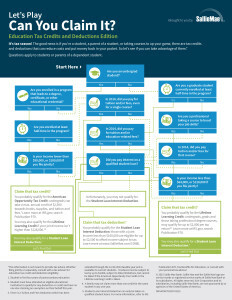 Students and students’ families have three primary tax benefits available to them, all very well compared and contrasted in this handy chart brought to us by the good folks at the IRS. 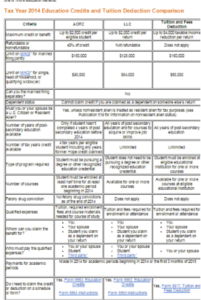 While last week we saw a breakdown of how to determine which benefit you may qualify for this will help fill you in on the details of each. Families need to be aware of these benefits during tax time, take advantage of them, and plan accordingly for future years. An extra $2500 per year, per student can make a significant difference in affordability in many cases. Further, non-traditional and/or non degree-seeking students have an incredibly unique opportunity to redirect their tax dollars to personal betterment. We’ll discuss these benefits more in our another post. 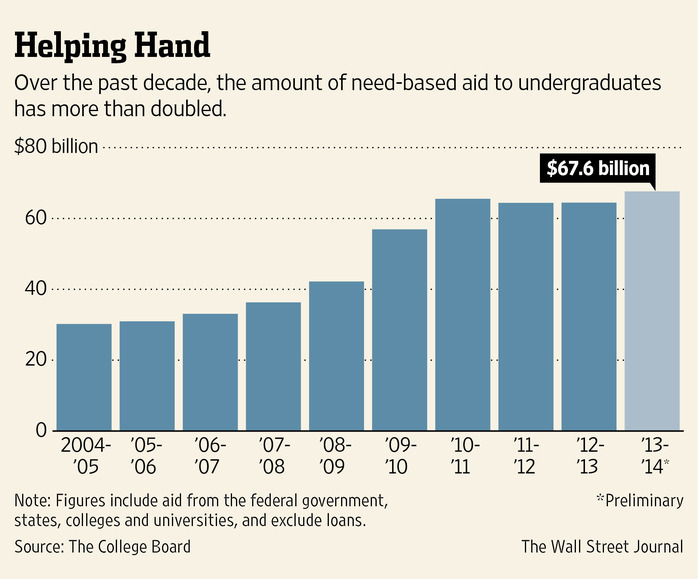 As the chart clearly states, “over the past decade, the amount of need-based aid to undergraduates has more than doubled.” Meanwhile, family incomes and other types of college help have remained relatively flat. As a result need-based financial aid funds and systems exert tremendous influence over schools and students alike. In summary, yes. Most students seem to have little clue about how much debt they have accumulated, even as they continue to borrow in pursuit of an education. I suppose any of us who have been to college or deal with current college students are probably not surprised by this. We tend to be clueless about the sum or consequences of our loans right up to the point we start paying them… after we graduate. The most shocking tidbit comes deep into the report when the authors discover that aside from misestimating debt loads, a goodly percentage of those with loans have no clue of this fact. The money quote: “Borrowers who are not aware they have any federal debt are surprisingly common. The NPSAS data indicate that 28 percent of first-year college students with federal debt reported that they did not have any federal debt. This may be partly the result of confusion about federal vs. other kinds of debt. 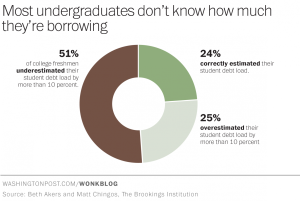 Among students with federal debt, 14 percent reported having no debt at all. In other words, more than one-quarter of students do not understand that they have a loan from the federal government, and about half of these students appear to be genuinely unaware of the fact that they have borrowed for their education at all.” (Emphasis Mine). 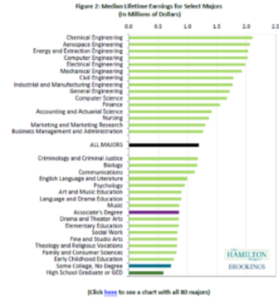 This chart comes to us from a report by Brad Hershbein and Melissa S. Kearney of the Hamilton project titled “Major Decisions: What Graduates Earn over Their Lifetimes.” The chart/research lets us know a few key findings that we may find helpful beyond the usual high school vs college earnings averages.